Google are placing more emphasis on Google My Business (previously Google Local Business Center). Google Places has morphed to the Google Map Platform. 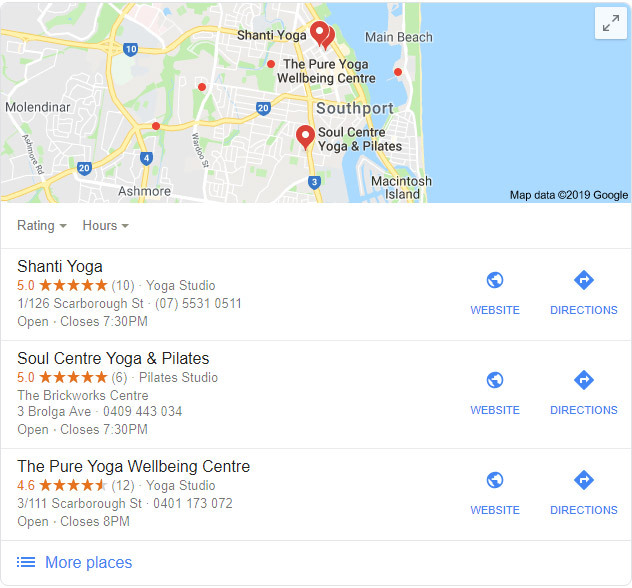 The organic web results are now combining Google My Business, Google places results with the organic results, which are the results that are not paid for in ads. Previously we were seeing Google Map entries as a seperate addition to results now we are seeing them combined. If you do a query like Gold Coast Yoga the results will come up as per the image above. Google My Business is the main goto now that Google+ is shutting down early 2019. Older legacy information may still be on Google Maps that also come up in searches. The key for a search is for it to be regarded as relevant to the query which is where an SEO can help. A good article to refer to is Anatomy of a Local Google search. An affordable local SEO is a big advantage to your business. An SEO will be aware of changes to Google My Business - it is important to not set and forget your listing - again a good SEO can help here. Google search results are usually very consistent and reward sites that are established and have good quality links. Algoriths for SEO and improving your sites rankings are disguised by Google. A skilled SEO will have the experience to understand the ebbs and flows of search results. An SEO should ideally be a good content creator. An SEO should ideally be a good content creator. There are various types of content from blogs, images, social posts, YouTube videos, PDF documents, scripts and many more. Generally all content adds value to your site, so a skilled content creator will generate content most appropriate to improving your SEO rankings. The very spammy attempts by recent SEO's have changed the way Google handles certain sites - a new site can have a delay before reasonable results are achieved. Previously many web developers stacked the domain name with long keywords WhyDontYuBuyAReallyLongDomainForSEOAnymore.com the theory was the keywords would help search results. A short memorable domain name can be a better option in recent times. Generally I try to specialise in techniques that are not easy to duplicate are related to the sites location and are backed up by some research. For every advancement that allows novices to create web pages with builders the techniques for advanced web developers always moves ahead exponentially by comparison.